Renée Sporre-Willes with a group of her Norwich Terriers, autumn 2013. I bought my first show dog in 1965, a Pug that became a Group winner and a famous stud dog. In a few words, I was hooked to this hobby and have been ever since! I have bred and/or owned 284 champions in four breeds since the first litter of Pugs was born in 1969 under the prefix of Cobby’s. It is a sheer coincidence that the name Cobby was chosen for the FCI mascot. I cannot claim any credit for the charming Pug-like, Steiff-manufactured “cuddly” FCI mascot! But I cannot deny that I think it is a delightful resemblance to my prefix and I love the sweet Cobby mascot, as it gives such positive vibes! (cobby means something stocky, chubby and compact, like a Pug dog). I got my first Norwich Terrier in 1972, she was the first Group winner in the breed in Sweden. (I still breed Norwich and made up my 160th homebred Ch. in 2013). I also bred a few litters of Pekingese in the 1970s. I recall proudly that in 1979 Sweden’s Top winning male and female in Pekingese, Pugs and Norwich Terriers were bred by Cobby’s. I introduced the Lagotto Romagnolo in Scandinavia in 1995. The breed is the 19th most registered in Sweden 2013! A popular breed, apparently not only thought by me! I initiated the Swedish breed Clubs for Pugs, Norwich Terriers and Lagottos, arranged their first shows and produced their magazines. I was the co-editor in chief of the Swedish Kennel Club Magazine Hundsport from 1981 to 2011. How long have you been a member of the FCI Standard Commission? I was elected in Mexico in 1999 and have been its president since 2007. Was your specific interest for this commission a result of your famous encyclopedia or vice versa? My interest in standards begun long before I wrote the first Encyclopedia, or was appointed to write all about dogs in the Swedish National Encyclopedia, a work that started in 1986. As a journalist I have a keen interest for words and their meaning. At a very early stage, when I started to show dogs in the mid 1960s, I begun to study standards to understand why the opinion of judges was at times very different. I had valuable help from a Pug breeder, Mr Bertil Sted Gren, who was also the head of the Swedish canine organisation’ Standards Committee. What is your main task within the commission? I revise, prepare and correspond with the member countries about required amendments in their standards that are to be viewed by the Commission at a meeting. I also prepare the agenda with enclosures that are then sent to the FCI office to be copied and sent out to the Commission members. The members receive the documents about five weeks prior to the meeting. I also prepare and write any proposals that the Commission need to consider. In case of an application for a preliminary recognition of a new breed, quite an intense communication can occur before the standard is ready to be on the agenda. I lead the Commission meetings and take notes. After the meeting, I write the minutes and also any proposals decided to be presented to the FCI General Committee. Minutes have to be at the FCI office within a month after the meeting. For many years we have had a very prosperous and friendly collaboration with the Scientific Commission and we keep our annual meetings at the same place and time. The second day we have a joint meeting. Nowadays, with the awakening health aspect in pedigree dogs, we have even more issues that involve both commissions. The Standards Commission recently got permission by the FCI General Committee to decide, in coalition with countries of origin, on the illustrations on the standard cover. It is the member countries that send in their choice of illustration. The aim is to present as typical a specimen as possible, but opinions as to what is perfect can - as we all know - be very different. Long ago, it was said that the cover illustrations should show what a breed should look like and be illustrated with as good a specimen as possible. I think that is still a fair goal. As Commission president, I also answer questions, not only from the members, although it is always asked that the public present their questions first to their own canine organisation. I, as well as the hard-working staff at the FCI office, like to be of help and try to sort out minor questions as best as we can. How do you start/organise your investigations? Upon receiving requests from members to either have their standard amended or totally revised, then called a “new” standard, I adapt the standard to the FCI Model standard format. The standard is then sent back to the country of origin or patronage for acceptance. Quite often there is a communication about phrasing, interpretation and not least adjustment in the text to also be in accordance with health and welfare issues for the breeds. When we have completed that work I put it on the agenda for the Standards Commission annual meeting where the standard will be studied by my colleagues in the commission. Sometimes, we also need to ask the Scientific Commission for advice at our annual joint meeting. After the meeting, the standard is sent back to the country with any questions or suggestions as a result of the commissions’ meeting. When cleared, it is sent to the FCI office to be included on the agenda for the next FCI General Committee meeting. The FCI General Committee usually holds two meetings a year, so there might be a longer gap before it is viewed by the FCI General Committee. It is the FCI General Committee that has the final decision and they might also have questions/remarks/suggestions that need to be forwarded to the country of origin before the General Committee‘s final approval. When that is done, the standard is directed to the FCI office where amendments are edited and translated into the standard and a totally revised standard is translated into at least three of the four FCI working languages before it is published on the FCI website. It is a time-consuming procedure, but considering the importance of the document, it is essential that time is granted. Standards are not to be revised again within a 5-year period. It is an ongoing procedure that at times is a full-time work. I would like to do more updating of old standards, but one has to consider that most of us do this on our spare time, which means that prompt mail response is not always to be expected from either party. I suppose the main thing I have carried out to ease the work is the updating of the Model standard, as it is a vital tool for corresponding with the members. I have during my time in office repeatedly revised the FCI model standard with new advice when a need for update has occurred. All additions have to be approved by the FCI General Committee. The first Model standard, that is the frame for the current one, was written by former Standards Commission’s president, Mr Raymond Triquet. It was approved by the General Committee in Jerusalem in 1987, hence it is sometimes called the Jerusalem model. The Model standard is a document aimed as a guide with advice to what a standard should be –as well as to what it should not include. In recent years, I have also added an illustration on Anatomical Features to the last page. The awareness of not using wording in the standards that might jeopardise health and welfare issues in the breeds is probably also something I have intensified. I have been involved with health issues in pedigree dogs, mainly regarding text in standards since the late 1980s. Sweden, as one of the first countries that held seminars with their judges regarding exaggerations in breed type caused not only by old unfortunate actions that “more is better”, but also as a result of a trend setting that begun in the early 1950s. Coat presentation became more exaggerated, as did breed types. Some breeds still suffer from those effects. Denmark actually adopted the Swedish idea before Sweden did, that is to address judges before their appointment, as to what breeds have issues that need extra attention from the judges. Standards were in many cases written hundreds of years ago, when situations were totally different and there was no political or public opinion and internet or Facebook, etc. did not exist. The temperament required many years ago for certain guard work is for instance impossible to ask for in a modern standard. I hope that the members are aware of the political risk involved in not considering the standard text when it comes to of wording and requirements that can cause political actions. Several countries have had breeds banned so the threats are there and will be carried out when politicians find reasons. Breeds and their standards are, to my mind, to be regarded as cultural legacies. All breeds cannot - and in some cases should not - be used for their original purpose, BUT although we of course aim for a sound, fit-for-function pedigree dog with a temperament that is acceptable in today’s human society we also like to keep the frame, the phenotype that resembles the original type and not the one that the later part of the 20th century turned into an exaggerated type (“hyper” type). The aim is to keep the morphology of the ancient breeds, but to adapt their temperaments to modern standards and society’s requirements. This is not to be interpreted as a wish to discard the working ability in the working/hunting breeds. Those traits are indeed valuable to keep. Your encyclopedia is well known in the Scandinavian countries, unfortunately only in Swedish. Are there plans for translation into English some day? An updated version is planned, when will it be available? The second edition was launched in the autumn of 2013. It is ten years since the first edition of AVH was published. 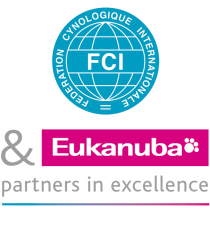 This new edition is extended to cover all FCI-recognised breeds, as well as over a hundred nationally recognised. All the FCI breeds are published with a photograph. I have given much time to get the best possible pictures, quality and type of course, but also of standing dogs without being handled and of correct colour, and in excellent coat condition. I have worked with some of the world’s best dog photographers, from all over the world. In my opinion, it is also thanks to their splendid work that the book has received such good reviews. Judges have been very complementary as they call the book their best travel companion to judging appointments! Front and back cover of the Encyclopedia on all FCI-recognised dog breeds, “All Världens Hundraser”. The Encyclopedia (All Världens Hundraser, AVH) on pedigree dogs is written by R.S-W. The second edition was published in 2013 and is a much extended edition, updated with all FCI internationally recognised breeds up to autumn 2013. RSW commissioned and selected all photographs from some of the world’s most skilled dog-photographers. The text is in Swedish and features 482 breeds, all the FCI-recognised breeds, as well as many nationally recognised. This encyclopedia is not your only book, is it? What more books have you written? No, I wrote the first breed book in 1978, one on Pugs. I have since written a much extended one on Pugs, several editions of the book on Lagotto Romagnolo, an Encyclopedia on breeds in the Nordic countries, as well as the Encyclopedia on FCI breeds; those books are written in Swedish. In English, I have edited and contributed to The Norwich Terrier by Marjorie Bunting, also contributed on all the FCI breeds in an Encyclopedia, by the late Ann Rogers Clark and Andrew Brace. At the moment I am finishing the book on the collections of the Swedish Kennel Club Museum. It is in both Swedish and English and will be published in time for the celebration of the Swedish canine organisation’s 125th Jubilee. The Swedish canine organisation was founded in December 1889 and as I contributed 25 years ago to the Centenary Jubilee book with layout, special articles, research and text on all photographs – I’m beginning to feel ancient! And you are a most respected judge too. When did you start judging and when did you become an all-rounder? I was asked by the board of the Swedish Toy Dog Club to participate in the Swedish canine organisation’s education for show judges in 1976. In those days, you could not apply – you had to be invited! I passed the one week long course and the following apprenticeship and judged at a championship show for the first time in 1977. I was appointed an all-rounder, eligible to judge all FCI-recognised breeds in 1997.